Instruction For Use: Use as a condiment for Chinese cuisine. Store in a cool dry place. Keep refrigerated and use within 1 week after opening. Ingredients: Turnip (35%), Cowpea (30%), Vegetable Oil, Salt, Sugar, Chilli, Ginger, Garlic, Cooking Wine, Spice, Flavour Enhancers (E621, E635), Antioxidant (E270), Acidity Regulator (E330). 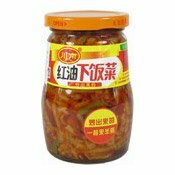 Simply enter your details below and we will send you an e-mail when “Spicy Mixed Vegetables (川南香辣下飯菜)” is back in stock!